We've been in South Africa now for over three weeks and we wanted to tell you about some of the things we've seen and heard regarding race, which still plays a huge part in South African society. Of course the news of Nelson Mandela's death on December 5th brought South Africa into the forefront of the world's media again, and so we were very curious as to how life since the end of official Apartheid has been for all races who call South Africa their home. I think first we have to give you a very brief outline of a complicated racial history. The minority white population here makes up about 10% of the total number of people. Then, there is another 10% who would be called or would consider themselves to be "coloured". This highly mixed group of people is pretty much anybody who wouldn't fit into the black or white category. The remaining 80% majority are Black. Between 1948 and 1990-1994 the ruling white Afrikaans operated under a policy of official Apartheid. In basic terms, what that meant was that people were physically separated based on the colour of their skin. They could only live in areas with other people of the same colour, and people were physically removed from their homes and resettled in other areas. In many instances, their homes and their communities were bulldozed to the ground. The white people got most of the good jobs, most of the best education, and owned most of the land. The coloureds had it worse than whites, but not nearly as bad as blacks. There were coloured townships where those people lived, and black townships where those people lived. Conditions were horrible in most of these townships. In most of the black townships, they are still horrible even twenty years after the end of official Apartheid. Yesterday, our couchsurfing host Leizel took us for a tour of the townships around Port Elizabeth. She would have been considered coloured, and her family grew up in a coloured township area during those years. You can visit some of these townships as a tourist with a small tour group, but we didn't want to see it that way. Many white people who live in Port Elizabeth today wouldn't ever think of visiting the townships. And most never have. On your own, you wouldn't be welcome in a lot of cases. White people have no business in the townships. Typical homes in Walmer Township. We purposely didn't take very many pictures. We didn't want to bring attention to ourselves, and to be honest we got a lot of stares as it was. 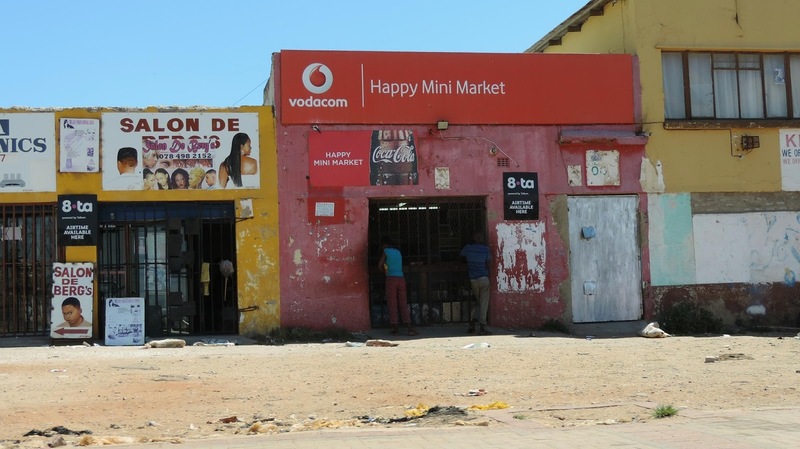 We get the impression that life in the townships hasn't changed very much for a lot of the residents there. However, as one of our couchsurfing hosts said, "During Apartheid we didn't have a lot of choices and there was a 50% chance that you would turn out bad. At least now, we have choices and it is up to you what route you take in life". Near the township of Soweto-on-Sea. A few of the people in the townships have increased their standard of living through employment, but their friends and family live in the townships so they want to stay there. So some of the housing has been improved or added to even in areas where many of them live in shacks. But a lot of the 70,000 or so people in Soweto-on-Sea live in areas like this. Race seems to still play a huge part in society here. The current ANC government has policies in place where employment is based on race. This has of course helped the black population as there are now twice as many employed blacks as there were in 1994, but we've heard from many people that a lot of people get jobs who aren't qualified for them, or there are better qualified people but they aren't of the correct race. Shacks that used to be operating as businesses have been replaced by these steel shipping containers. They seem to have been sponsored by MTN, one of the local cellular companies, and the local Economic Development Board. There also seems to be a lot of racism by the blacks against the whites. Some of it violent, as militant black groups seem to have targeted whites as they try to reclaim land that was taken away during Apartheid. There is an official reclamation process offered by the government but you have to have documents to prove that you owned the land. When Mandela came to power in 1994, he instituted the Reclamation of Lands Act that promised that 30% of white owned land would be redistributed to the black population, however to date (20 years later) they have only completed 7%. Despite the high crime rate in the townships, there appears to be a tremendous amount of community spirit. People out in the streets mingling and socializing that we don't see in a lot of the white areas because most people in the white residential areas live behind the walls and razor wire protecting their homes. This is a very generalized statement. Of course there are exceptions in some of the tourist areas, but in the cities, this is what we see. We went to the local graveyard of the black people. Some graves have very basic headstones, some without any headstone at all, and a couple of fairly elaborate ones. Leizel led us to one fairly recent grave. The graveyard for the blacks. The grave of Raymond Mhlaba. Raymond Mhlaba was a freedom fighter along with Nelson Mandela. In fact, they spent many years imprisoned together at Robben Island. He died in 2005, and wanted to be buried with the people. There are areas that are multi racial, in fact even areas that used to be totally white can have black and coloured people now making up perhaps as much as 20% of the population. The huge difference in living standards between the races is what we didn't really expect. We figured that twenty years after the end of official apartheid there would have been more integration. But the vast majority of whites have no association with the blacks other than to employ them as household help. We're starting to understand that it's going to take several generations to fix the problem, and even then there are no guarantees. Unfortunately we haven't had any opportunity to speak with the blacks themselves. We've spoken to white Afrikaans, and quite a few coloured people, but there aren't very many black South African people on couchsurfing! The whole experience has really opened our eyes to something that we had only heard about and we're really grateful to the people that we have spoken to for giving us their insight. It's impossible to tell as much as we would like to here. There have been entire books written about the subject, so of course we can only tell a very small part of the story. But we're glad to see that for most people, thing are slowly improving. But there is still some obvious dissension. Whether or not time will heal all wounds, is yet to be seen. The Nelson Mandela Voting Line sculpture in Port Elizabeth. "The world of apartheid was so perverse that if I could have been given the choice to be a very clever black kid or a very stupid white kid, if I wanted to live a good life I would have been well advised to choose the very stupid white kid. During apartheid, the cleverest black kid was not likely to achieve a quality of life that the dumbest white kid could achieve". Author Charles Cilliers in his book "For Whites Only". It may never happen in our lifetime. The scourge of colonialism and the subjugation of other peoples (yes, that's the correct term) has far reaching consequences. I'm sure some efforts are well intended, but the policy of hiring or advancement based on race is a non starter for one. Look at "Affirmative Action" in the States and see how that has played out. You are correct Bob, it may never happen in our lifetime but it will change bit by bit with each generation and certainly will help. Great write up. It never ceases to amaze me how awful man has been, and continues to be, to his fellow man. Glad progress is being made in SA. Seems to be going the other way in so many other places. On a different note. I know you like your beer Kevin, and Ruth her wine. What has been your favorite(s) of each? Here in South Africa, I like Castle Lager. In Namibia, I liked Tafel Lager. Still, I'm looking forward to a nice cold Victoria when we get to Mexico in March! Ruth likes a lot of wine, but we had a really nice one last night called Coral Reef Cabernet Sauvignon. What Kevin meant to say is that I like a lot of different wines. We did have a good laugh about his wording though! I'm afraid Bob is likely correct. One doesn't have to look very far to see why if they live in the USA. The legacy of slavery here continues to present complex socio-economic problems some 100+ years after it's 'official' ending. You are right, we never really thought about it in those terms and 100 years is a long time. Change has been happening through the years though, amazing that it has to take so long. Thanks for writing on this difficult subject as it is so much of what South Africa is. As a tourist you cannot ignore the obvious extreme differences in how people live there. My question to you both is when you were travelling in Namibia, did you have the same observations and/or experience as you have seen in South Africa? I have been really enjoying reading about your adventures! There was to a extent in Windhoek and Swakopmund but most of the other places we really didn't notice it much. Namibia has a much smaller population and much of it is rural and we believe that is why there isn't as much evidence of this. Soweto does not appear to have changed much since the student uprising of 1976 protesting the forced introduction of the Afrikaans language into the educational system. Change is coming painfully slow for the vast majority of South African people. Croft, we were actually at Soweto-on-Sea, a suburb of Port Elizabeth. This is not the same Soweto that is a suburb of Johannesburg, however it was named after that Soweto. Having said that, I'm quite certain that the Soweto near Joburg hasn't changed that much either! Humans are very resistant to change even if it means a better life for everyone. So 20 years is just a drop in the bucket of change. When I moved from Montana to the DC area, I was shocked to find out that the Civil War is still being fought by some folks. And racism was still alive and well. I had no idea. I am so happy to be catching up with your travels. What a wonderful journey. You are correct, many people resist change. It is so hard to believe that there are still issues in the United States with racism even after all these years. As I mentioned, with each generation things do improve. 20 years isn't very long for change. Think how long it's taking in the States. Yep, I guess 20 years is just a drop in the bucket. I would be nice to change come faster though, especially for some of these people. Education seems to be the key to improving the quality of life. Here's an interesting perspective from Kenyan actress Lupita Nyong'o (12 Years a Slave). She says that growing up in Africa she didn't think of herself as black. "In America more so than in Africa for sure, your race determines people's perceptions so deeply in a way that you may not have considered. You have to learn to be black in America, you have to learn what comes with the skin colour." We keep learning more as we travel. We are really looking forward to this next part of our trip. Kinda sad that change takes so long. Even with great men like Nelson Mandela, progress is slow and tedious. My guess is that the white population doesn't want to lose what they have. I don't understand why this is, but then again I live in Canada, where color of a person's skin isn't a huge issue for most people. It is sad for sure. If everyone could treat everyone as they themselves want to be treated, the world would be a much better place to live.